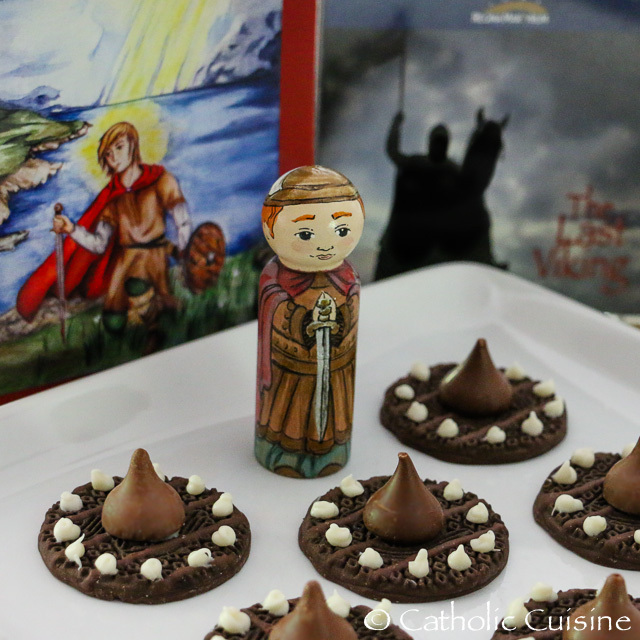 The Feast of St. George is coming up tomorrow. We have spent many years slaying a cake dragon in honor of this noble and holy saint. Last year, however, we made a Dragon Scone for the feast of St. George. If you are looking for an alternative to the Dragon Cake and would prefer something not slathered in frosting, maybe give this one a try. I used a basic scone recipe (which I will include below) to make a serpentine shape. It took a little longer to bake than normal scones but otherwise, everything else was the same. Last year, I used a left over slice of cake to make the head. This year, I think I'm just going to use another scone. That will probably mean I'll make a double or a 1.5 batch of of the recipe below. I covered the body in homemade whipped cream and used sliced strawberries for the scales and feet. The pastry wing was also leftover from Easter brunch. I'm not sure our dragon will have wings this year. Two M&M's make the eyes. 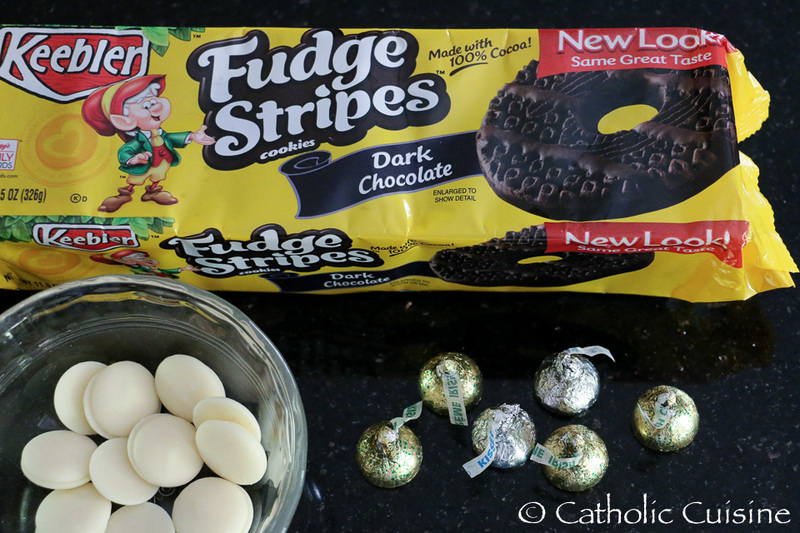 You can serve it for breakfast or as an after dinner treat. Let us know below… are you doing anything special for St. George's Day? Preheat oven to 400 degrees. In medium bowl, combine flour, sugar, baking powder and salt. Using pastry blender, cut in butter until mixture resembles course crumbs (you can use a food processor just pulse it to get the coarse crumbs). Stir in sour cream (greek yogurt) and milk. Turn dough out onto a lightly floured surface; roll out to 1/4 inch thickness. 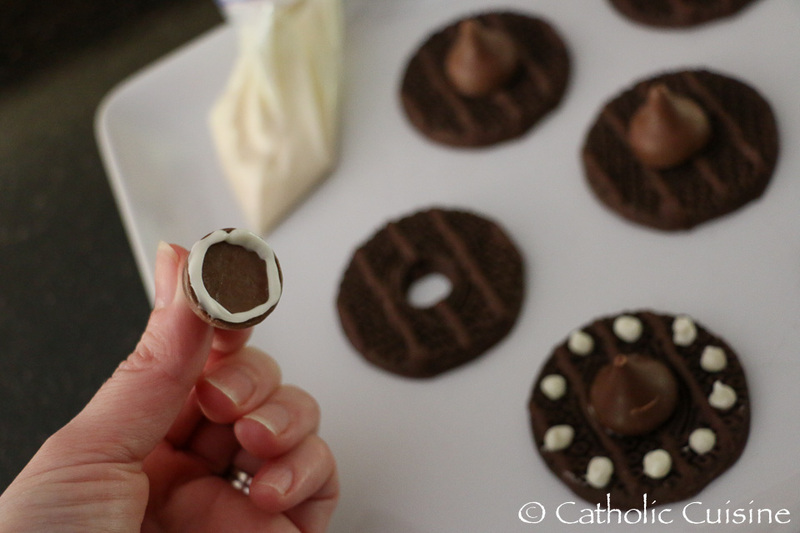 Cut out desired shapes, place on parchment paper covered cookie sheet. (For the dragon scone, I just shaped the dough into the shape I wanted on the cookie sheet. Sprinkle with sugar, if desired. Bake 12-15 minutes or until lightly browned. The feast of St. Magnus, Earl of Orkney, is celebrated on April 16th. 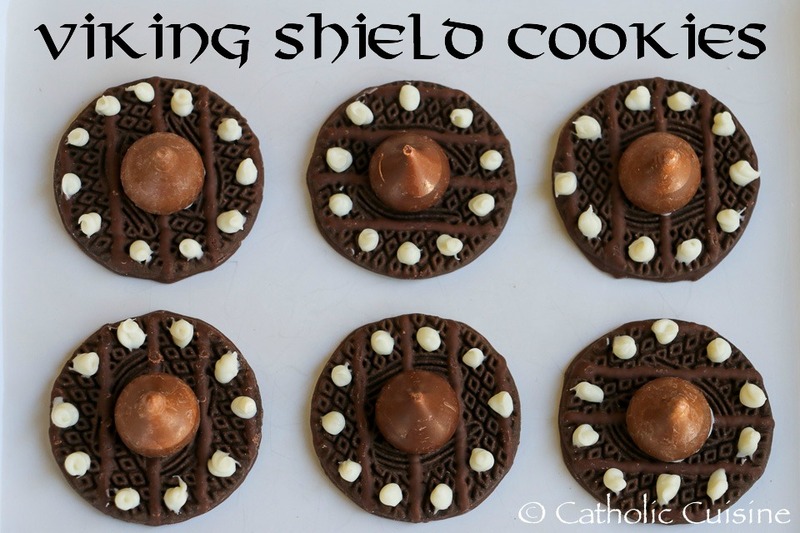 To celebrate his feast this year I made some quick and easy Viking Shield Cookies with a few ingredients I happened to have in my cupboard. You can find additional photos, prayers, and book suggestions over at Shower of Roses. 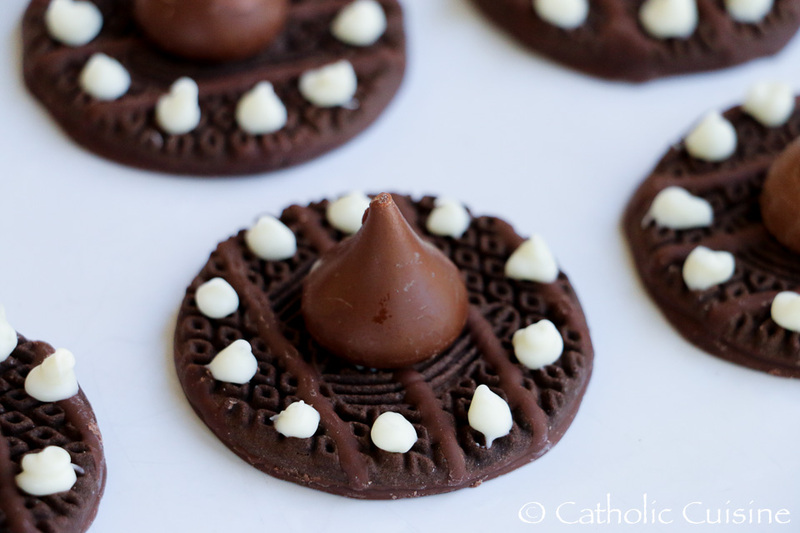 Unwrap the Hershey Kisses and place one over the center of each Fudge Stripes cookie. Place the melted candy (or melted white chocolate chips) into a baggie and clip off the corner with a pair of scissors leaving a small hole. 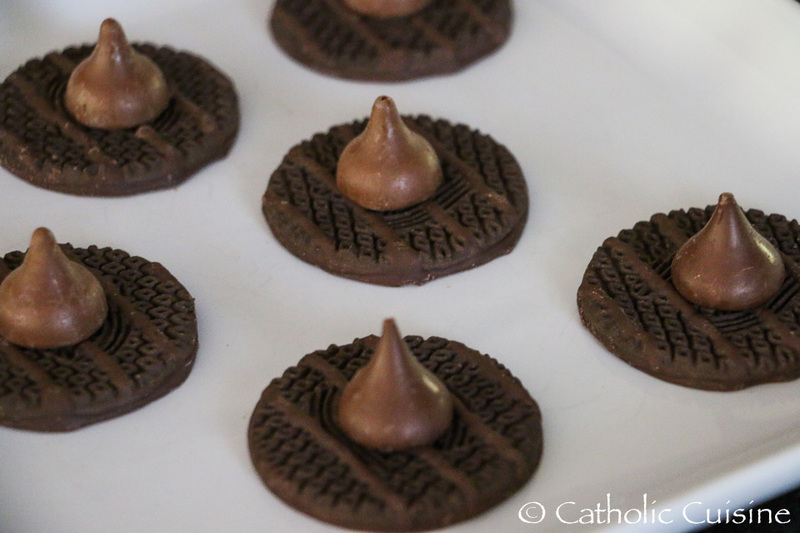 Squeeze some melted candy onto the bottom of each Hershey kiss to attach them to the cookie. Add additional dots of melted candy around the outside of the shield. Let dry. Happy Feast of St. Magnus! The following recipe was submitted by Susan, from Sole Searching Mama, for the feast of Divine Mercy. Thank you, Susan! Preheat oven to 350. Dissolve jello in ¾ cup boiling water. Add ½ cup of very cold water to the jello, set aside until it reaches room temperature. Bake the cake in a 9” x 13” pan as directed (I added 1 tsp. clear vanilla to the cake to give it more flavor.). Cool the cake for about 30 minutes. With the cake still warm, poke holes in the cake about ½ inch apart. I used a chop stick and wiggled the stick a bit to create an open hole for the jello to flow into. Slowly pour the jello into the holes. Place the cake in the fridge to chill. In a bowl, blend together dream whip, pudding, cold milk and vanilla until stiff and fluffy, about 4-6 minutes. Frost the cake and garnish as desired. 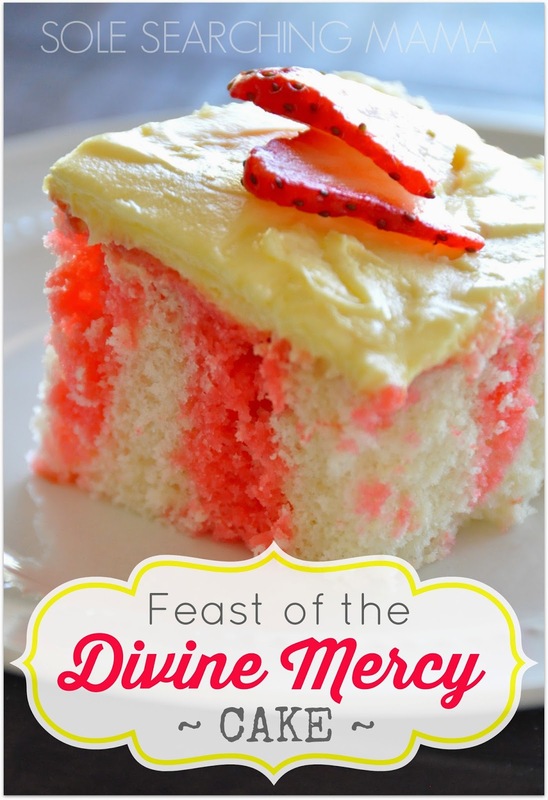 Additional recipes for Divine Mercy Sunday can be found in the archives! The following post was submitted by Sarah Rose, from Rose's Supposes, for the feast of St. Agnes which is celebrated on April 11th. Thank you Sarah Rose! While still knowing very little about St. Gemma Galgani, our family asked for her intercession to help with my husband's back pain. When I saw that her feast day was coming up I did a little more research and found that she has an incredible story. She was devoted to Christ's passion, and had an intimate relationship with Jesus which included ecstasies and bearing the stigmata. She greatly desired to be a nun, but was unable to due to her poor health. Even so, because of her devotion she was buried in the Passionist habit. 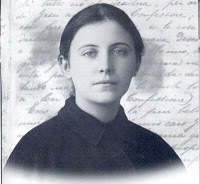 You can learn more about St. Gemma at www.stgemmagalgani.com. This website even has a great little comic about St. Gemma for kids, which I've linked to directly here. I also found that she would be a great intercessor for my husband in more ways than one. Not only is she patron of people with back pain and people with frequent migraines, both of which my husband struggles with, but she is also the patron of pharmacy and my husband is almost complete with his pharmacy tech certification! What a wonderful discovery for our family! To help celebrate this wonderful saint we had Italian for dinner, because she was from Italy, and a chocolate cake depicting the symbol on the Passionist habit. I wanted to use a heart shaped pan, but we're in a transitional stage right now and all my special pans are in box somewhere. I've included the recipe for my spinach alfredo lasagna, and a picture of the cake. To make the cake I simply used a boxed cake mix and store bought frosting. Hey, its a weeknight! 1. Boil the lasagna noodles. While they cook brown the meat, and mix the spinach and peppers with the ricotta cheese. Drain the noodles. 3. Bake at 350 degrees for 45 minutes to an hour. Enjoy!